Gravity Flow version 1.7 is now available via auto-update and for download from the account page. This is a feature release that includes deeper integration with Sliced Invoices, step expiration enhancements, and new email options for the User Input step. 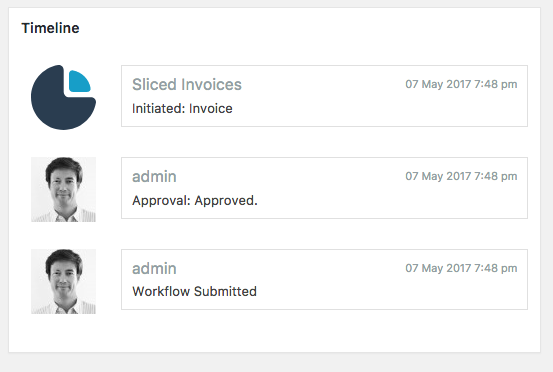 Gravity Flow now integrates even more deeply with the hugely popular Sliced Invoices plugin. You can add a step at any point in the workflow which will generate a quote or an invoice. Gravity Flow v1.7 adds additional functionality to the Sliced Invoices feed settings – you can set the default status and also the line items can now be generated automatically from the order summary of pricing fields – list field is no longer necessary. By default, the workflow will continue as soon as the quote/invoice has been generated. 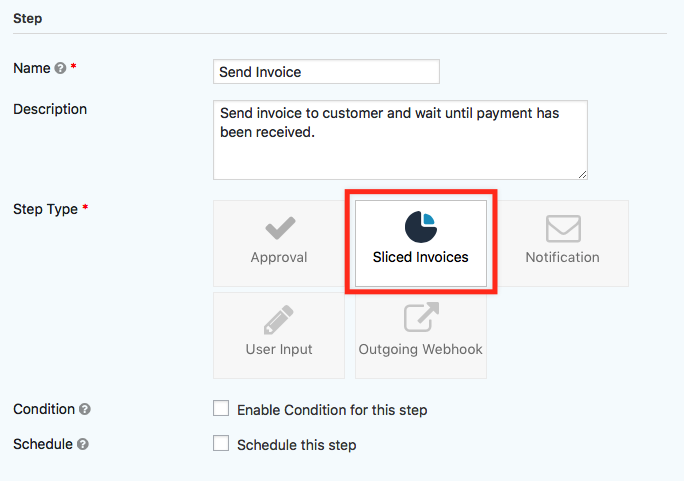 In v1.7, the new “Step Completion” setting on the Sliced Invoices step provides the option to wait until payment has been received before continuing on the workflow. No more chasing up customers for payment. For further details, check out the documentation. You can now configure steps to expire before or after a date specified in the value of a date field on the form. If the form has a date field, then the date field option will be available in the expiration step setting. The user input step now has two new email settings: “in progress” and “complete”. The “in progress” email will be sent when an assignee saves their progress in the user input step. The “Complete” email will be sent when the step is complete before continuing on the workflow. The “in progress” email is particularly useful if you have a Workflow Discussion field on the form and you’d like to notify other assignees when a new comment has been added. – Added support for unfiltered HTML in the instructions setting for users with the unfiltered_html capability. – Added the ability to configure emails to be sent when a User Input step updates the entry and remains in progress and when the step is completed. – Added the date field option to the step expiration setting. – Added settings to the Sliced Invoices step. The Assign To, Assignee Email, Instructions, Display Fields, Expiration settings and the Step Completion setting allowing completion of the step to be delayed until the invoice is paid. When the step is pending invoice payment the invoice details will be displayed in the workflow detail box on the inbox detail page. – Fixed an issue with the notification message when the Discussion field merge tag content exceeds the max line length. – Fixed an issue with the GravityView integration where the single view doesn’t display if an assignee is defined the Advanced Filter criteria. – Updated the “no assignees” note from “not required” which could have been confusing in some situations. – Added settings to the feed configuration page for the Sliced Invoices & Gravity Forms Add-On. for the default status of the invoice/quote. Updated the choices for the Line Items map field to only include List type fields and the option to use the entry order summary. – Renamed the User Input step ‘Default Status Option’ setting to ‘Save Progress Option’ and changed the setting type from radio buttons to drop down.